In the aftermath of Week 1, I wound up +61.5% on my full slate of entries ($52 in entry fees; $84 in winnings) so my very conservative bankroll management in the Week One games (only 5% of my total bankroll in play Week One) paid off in a positive weekend of play - I cashed in five out of eight entries (62.5%). 142.46 points was my high-water mark in Week One, with a low of 104. On the plus side - Julio Jones (30.6 points) crossed the 3x threshold on his $9,000 salary, and was an anchor for my best-scoring entries of the week, and Jordan Reed ($5,000 salary, 15.8 fantasy points) also got over the 3x bar, helping me out where I eschewed Greg Olsen. Brandon McManus ($4,500 salary, 18 points) and the Seattle D ($5,000 salary, 19 points) were also keys to my five winning entries. The "less important" positions of PK and D/ST of my roster were the anchors for my winning lineups this week, actually, along with Jones' explosive performance. Olsen was my worst play of the week - the penalties that erased his TD and then the long-gainer in that contest with Jacksonville forced me to swallow a paltry 1.6 points at FanDuel across several of my rosters - while my game script for Carolina was correct, things didn't break as anticipated for Olsen in Week One. I won't beat myself up too much about that call. But I am reminded to diversify my picks at tight end more widely - I liked Martellus Bennett and Jordan Reed last week, too, but didn't slot them into enough of my FanDuel lineups, over-relying on Olsen, who kept me out of the higher echelons of payouts in my winning GPP entries. Jameis Winston ($6,900) turned out to be the less-attractive rookie option in the Tennessee/Tampa game - his 16.2 points did pass the 2x threshold for cash-game relevance but he didn't help me out much in the GPPs - and Vincent Jackson illustrated that being a high-volume receiver (11 targets) doesn't necessarily translate to big fantasy points (4/51/0 receiving - 7.1 fantasy points at FanDuel) - just falling short of matching his $7,200 salary in fantasy points. So my favored QB/WR stack from Week One under-performed my expectations despite plenty of opportunities for Jackson to be an explosive performer. Mark Wimer: I look for value at all positions, and then build my rosters around QB-receiver stacks. So QB-receiver first when building rosters, then I look at my short list of prospects at each position for the week and juggle the lineups until I'm happy with the overall team. I come into roster construction with a list of players (including team defenses) I think have value for the week in question, and then go from there. This week I like the Seattle D, the Carolina D, and the Miami defense ($5,000, $4,800 and $4,700) at the high end of the range and Green Bay ($4,500) and the Jets defense ($4,400) in the middle of the range. That's an unusually high proportion of road teams, but Miami and Green Bay get offenses that are in turmoil due to injury (Chicago's receivers generally, DeSean Jackson for Washington) and drama at quarterback (prima-donna Jay Cutler; new starter Kirk Cousins) and look likely to crush their opponents thoroughly on the defensive side of the game in my opinion. Cleveland's offense is not impressive, especially in the passing phase of the game, making life easy for the Jets. Ditto for St. Louis (and St. Louis may start reserve running back Benny Cunningham this week due to injuries higher up the depth chart), easing the task of Seattle's defenders. Carolina has good pass rushers against the most-sacked quarterback in the league last season, Jacksonville's Blake Bortles. KC at the Arian-Foster-and-Andre-Johnson-less Texans with Brian Hoyer as the starting quarterback also looks attractive ($4,300) though KC generally has stronger defensive performances at home in thunderous Arrowhead Stadium. I eschew the bottom tier of defensive teams unless there is a huge, unexpected blow to the opposing offense late in the week after FanDuel has already set the defensive team prices—going cheap at defensive team generally has blown up in my face so I don't do it anymore. They are cheap for a reason, after all. 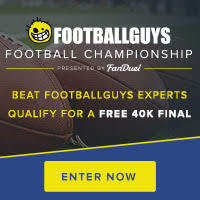 Onward to Week Two - I hope all of you reading this had fun playing at FanDuel in Week One!